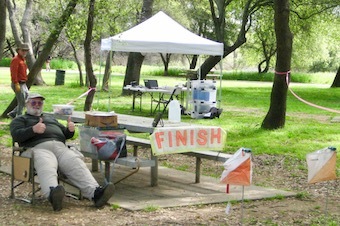 As predicted, it was a beautiful day in the American River Parkway for our first event of the year. The park is so lush from the recent rains that it was hardly recognizable. We even had a bit more sun than expected. 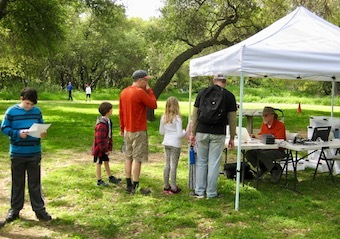 But it wasn't just the first event of the year, it was also our first time using electronic punch (E-Punch) (Editor's Note: We did do E-Punch once years ago for a meet that Jay used as part of the Bay Area Orienteering Club's Junior program; Jay ran the E-Punch). We had 79 participants running the five courses set by Jonas Libell. Jonas did a truly amazing job, a job made very challenging by our recent rains, which changed the topography of Sacramento Bar not once but twice in the last month. The introduction of E-Punch to our event also generated a lot of excitement. Jay Hann of Western Race Services drove over from the Bay Area to provide all of the equipment, advice and help to make it possible. On the White course, Greg Mandler once again won with large lead at 36:17. The Yellow course was led by a near tie between the Poland family and the Hannaford family at just over 37 minutes. On the Orange course, Dwight Foyil won at 84:11 followed by Kristin Weber 99 seconds later. Kyle Ketten and George Minarik, both from BAOC, led the pack on the Brown course. And our own Mats Jansson led the Red course by over 15 minutes. And all of you who just pitched in where you saw a need! We hope to see you all at future events. And we really hope you'll consider volunteering! The next two GCO events are Rossmoor Bar on April 9 and California State University, Sacramento, on April 29. And don't miss the next Nav-X event at Camp Tamarancho, Fairfax on April 23. See details and links on our Schedule page.